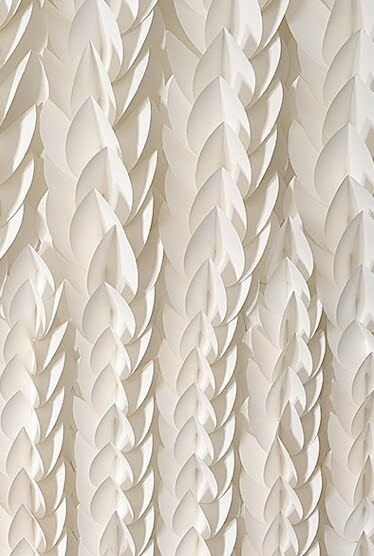 We love the quiet elegance of Liz Jaff's paper HEDGE, made with 1,714 individual folded parts and inspired by the well-manicured hedge that surrounds Jaff's Southampton, New York studio. A 1989 graduate of RISD, Liz explores the hedge as a formal structure that takes on both protective and mysterious qualities. 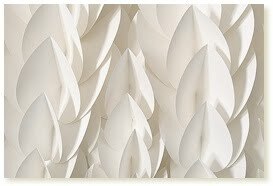 Paper is central to Liz Jaff's art and exploration of defining space through folding. 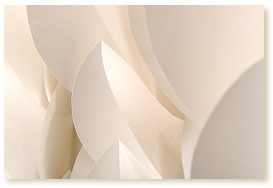 "I have been folding paper as a process in my work for about 12 years. As an activity, I like the repetition and rhythm. Formally, transforming a two dimensional shape offers all kinds of arrangements and opportunities for the play of light and shadow on different flat planes." HEDGE was featured last fall at the Kris Graves Projects in Brooklyn, and recently was the inspiration for a variation of the work for the home of a private collector. 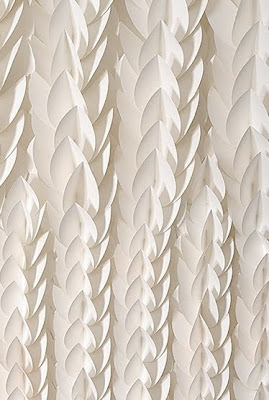 See more of Liz Jaff's elegant paper explorations here.